This page lists the current operational instruments available to users at the JCMT. A brief summary of their current status can be found at the bottom of this page. In 2016 at a workshop in Taipei possible future instrumentation was discussed. 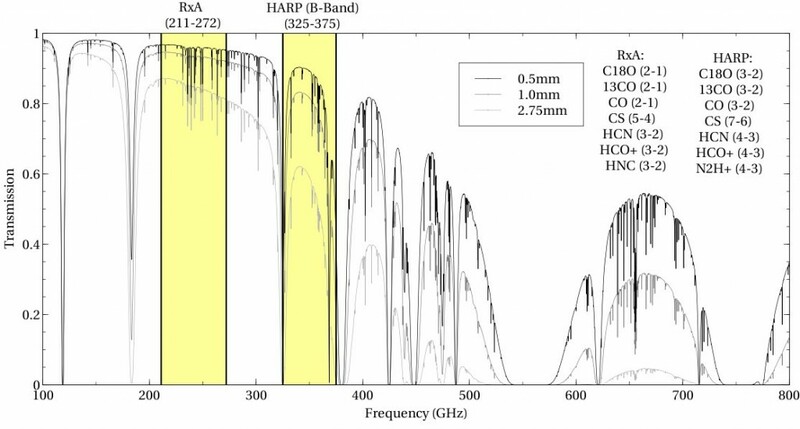 The JCMT currently has one heterodyne receivers in operation: HARP: 345 GHz, 16-pixel array receiver. The backend for the HARP receiver is the ACSIS correlating spectrometer. Receiver A3 (also known as RxA): 230 GHz, single-pixel DSB receiver has been retired (as of June 27th 2018). Plot of transmission as a function of frequency for different levels of precipitable water vapor. The two current heterodyne receivers HARP and RxA are shown in relation to this. SCUBA-2 is the JCMT’s continuum camera. I has four 32×40 detector arrays at 850 and 450 micron, in total 10240 detectors. Plot of transmission as a function of frequency for different levels of precipitable water vapor. The SCUBA-2 450 and 850 micron filters are shown in relation to this. It is clearly evident that 450 micron data requires good weather conditions due to the atmospheric window. 850 and 450 micron continuum camera. 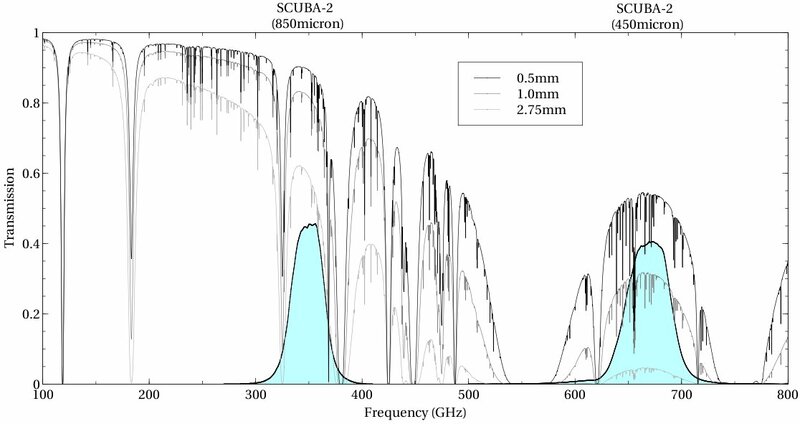 5120 bolometers (4 sub arrays x 1280 bolometers) at each wavelength band. Currently about 3500 bolometers are working at each wavelength band. Currently HARP cannot be tuned to frequencies 325-329 GHz LSB and 335 – 339 GHz USB. 14 of the 16 receptors (detectors) are operational: H13 and H14 are not operational. 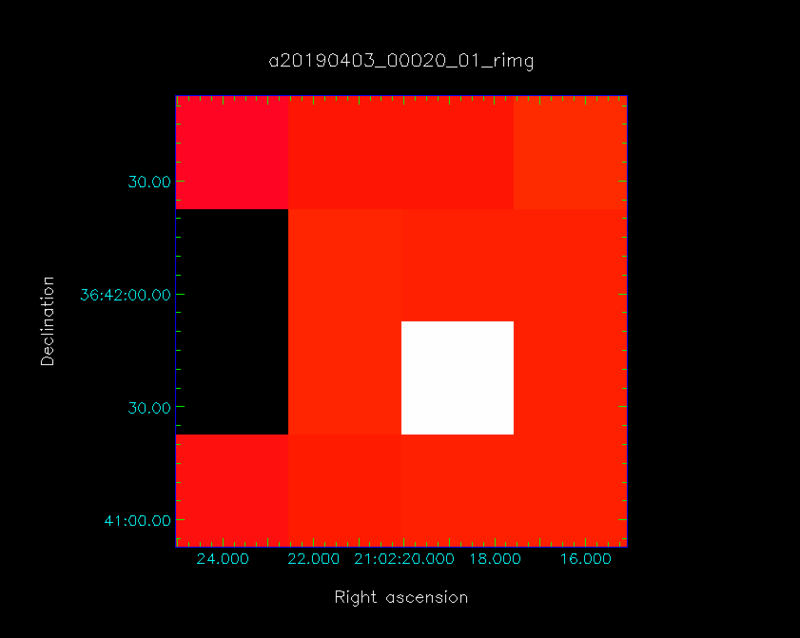 PIs with projects involving jiggle maps on extended sources may wish to review the central pointings and/or K-mirror orientations in their MSBs. Please review the below image of a recent observation of a standard object (white pixel) for a graphical example of the relative positions of the nonfunctional receptors. The lack of these receptors hampers jiggle mapping. Work is ongoing replace the broken receptors. The largest square fully sampled field of view with a HARP jiggle map is currently 1.5’x1.5′. If the full 2’x2′ jiggle field of view is required we recommend to use a small raster instead (114″x114″ 1/4 array spaced basket weaved). This will be less efficient with a factor of about 1.5 in time. 16 channel correlator with up to 1.8 GHz bandwidth. 183 GHz water vapour monitor installed in receiver cabin. Measures the precipitable water vapour along the line of sight at 1.2 second intervals. Of the two WVMs available the black WVM is currently installed. In 2016 the mixer was replaced by an SMA mixer and as a result sideband ratios are different from 1.0 at certain LO frequencies. This was also the case for the replaced mixer. It is planned to apply corrections in the data reduction. After replacement of the old 1980s micro computer, frequency switching has not been implemented. For D band observations SSB is strongly recommended even if DSB mode is possible. The DSB option has been removed in the latest OT version. For D band, channel A is displaced by 10″ on the sky from channel B (which is the tracking receptor). Localized baseline ripple in PSSW mode.